I was visiting a friend recently and flipping through a few of her old of her cookbooks. One of the cookbooks she has was Now Eat This! by Rocco DiSpirito. His lightened up recipe for Fettuccine Alfredo caught my eye. (as well as a few of his photos too, wink wink…) The photo looked really good so I definitely wanted to give his version a shot since the last diet Alfredo recipe I tried was not so great. This recipe does not disappoint, we really enjoyed it! 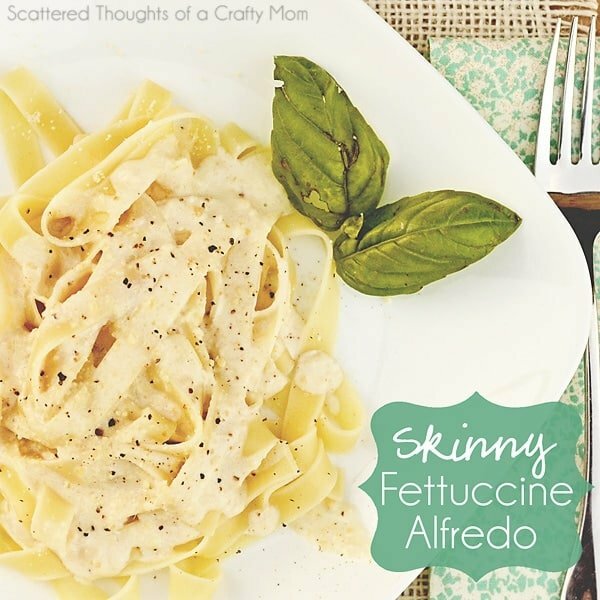 Skinny Fettuccine Alfredo from Now Eat This! by Rocco DiSpirito. While pasta is cooking melt butter in a non stick saute pan over medium heat. Add garlic and saute for 2 minutes. Meanwhile, combine the nutmeg and cornstarch in a small bowl. Whisk in the chicken broth until smooth. Pour the mixture in to the saute pan. Raise the heat and bring the sauce to a simmer, whisking occasionally. Whisk in 1/2 cup of the cheese and stir until it has melted. Remove the pan from the heat and whisk in the yogurt until the sauce is smooth. In a large bowl, toss the fettuccine with the Alfredo sauce. Season with salt and pepper and top with remaining cheese. That sounds so delicious … sometimes there's nothing better than a bit plate of pasta! It really does look good and I love that it is a lighter version! Thanks so much for sharing at Monday Funday! Found you on Skip to my Lou, this recipe looks delish! I will def have to try it! 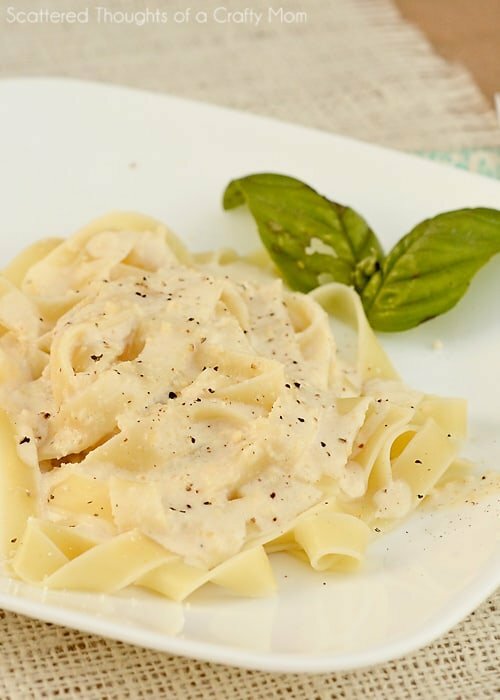 I just love fettucine alfredo and this looks like a wonderful low calorie dish! Ooh I am definitely trying this! Guilt free fettuccine! Found you through Monday Funday! This looks and sounds so delicious! I'm pinning this to make, but I don't plan to let my hubby see the low-cal ingredients. Thanks for sharing! Going to have to try this one for sure! I love alfedo but I hardly ever eat it because its just so hard to jusify! Thanks for sharing! Just saw your link over at Skip To My Lou's link party and had to come check out your Skinny recipe! I'd love for you to link up a few yummy recipes at my weekend link party @The Weekend re-Treat! Pinning this! Looks SO good! A great presentation for your awesome Alfredo. Hope you are having a great Valentine weekend and thank you so much for sharing with Full Plate Thursday. I have tried Alfredo with cream cheese but I love the thought of using greek yogurt and getting the boost of protein. You used Greek yogurt! WOW Love this recipe and this is different. I would love if you link this to my party happening now! Oh, we will definitely be giving this a try!! It looks wonderful. Thank you for sharing at Sharing Saturday! Ok, we tried this tonight. Thank you for sharing such a great recipe and it was perfect for a Friday meal during Lent. I featured it on my Facebook page!